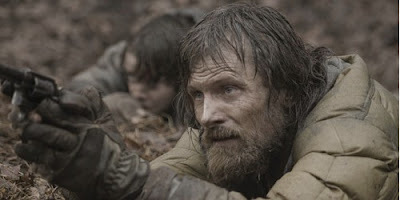 It's official - John Hillcoat's The Road has been bumped from its November release date, to an as yet undetermined date in 2009, which reports are placing in either February or March. Not only does that successfully remove it from the 2008 Oscar race, it most likely kills its Oscar chances period. An early 2009 release date will all but guarantee that it will be out of voters' minds come Oscar time next year. At this point it almost seems like the Fall 2008 season is cursed. Already we have lost Star Trek, Harry Potter and the Half-Blood Prince, The Soloist, and to some degree Defiance. Who wants to be the first to start a conspiracy theory about the producers of The Curious Case of Benjamin Button clearing out the competition? LOL on that BENJAMIN BUTTON conspiracy theory!!!! Nothing would surprise me. In any case, I actually did read McCarthy's THE ROAD over the summer, (was greatly enamored of it) and am disappointed that this has been pushed back.